You want it all: a high-powered career and a fulfilling life. But even when you work harder, smarter, and better, there are still unique issues you face as a woman in business. To get where you want to go, personally and financially, you need to know the roadblocks that could derail your goals—and how to blast through them with poise, passion, and purpose. Corner Office Choices offers a holistic approach to financial, career, and personal planning that will give you the tools you need to build your ideal life. Mining her years of experience helping female professionals, Bridget Grimes addresses common obstacles to reaching your goals and shows you how to get past them, covering everything from how to protect your assets to how to nurture your personal passions. 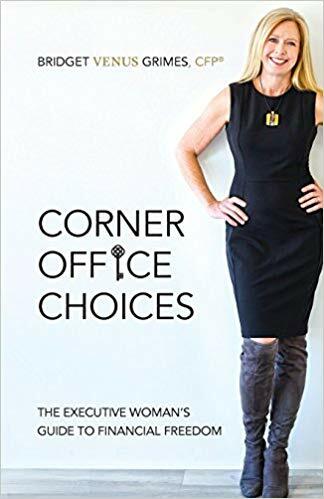 It’s time to bridge the gap between where you are and where you want to be—and Corner Office Choices is your roadmap to success. Bridget Grimes is the founder and president of WealthChoice, a firm focused on helping women turn their professional success into financial success. As an advisor to top-earning female executives, business owners, and attorneys, Bridget draws on more than a decade of experience to create customized financial solutions that help her clients achieve the life they long for. Based in San Diego, California, Bridget enjoys cooking, entertaining, and spending time on the water in the company of her husband and children. Visit https://www.wealthchoice.com/about/ for more information. This entry was posted in Award, celebrity, honoree, Recognition, women and tagged author, Bridget Venus Grimes, business owners, entrepreneurs, executives, financial success, founder, Today's Honoree, WealthChoice, women. Bookmark the permalink.